The CF mouse shows some level of involvement in nearly every process found in CF patients. Below is a summary of some of the major CF manifestations that are observed in the mouse. 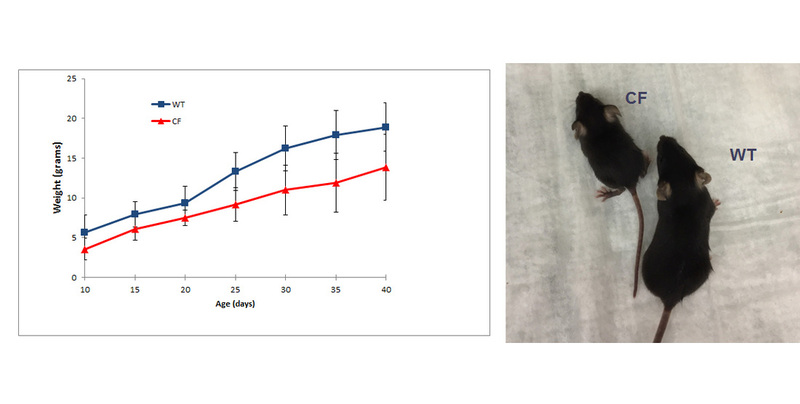 CF mice are typically between 50-80% of the size of their non-CF littermates (WT). CF mice display intestinal obstruction at a high rate which decreases survival compared to their non-CF littermates (WT). While CF mice have a milder lung pathology than CF patients, they do CF mice display intestinal obstruction at a high rate which decreases survival compared to their non-CF littermates (WT). Wilke M, Buijs-Offerman RM, Aarbiou J, Colledge WH, Sheppard DN, Touqui L, Bot A, Jorna H, de Jonge HR, Scholte BJ. J Cyst Fibros. 2011 Jun;10 Suppl 2:S152-71. doi: 10.1016/S1569-1993(11)60020-9.